Following in the footsteps of mega-bands like ABBA and Queen, the latest, somewhat unlikely group to be given the jukebox musical treatment is the Scottish duo The Proclaimers, with Sunshine on Leith. The film uses the music of the bespectacled Reid brothers to tell the story of two best friends, Davy and Ally, who return home to Edinburgh after a tour of duty in Afghanistan keen to get on with their lives. Ally rekindles a romance, Davy finds a new one, and Davy’s parents, Rab and Jean, prepare to celebrate their 25th wedding anniversary. But this trio of relationships all hit rocks on the night of Rab and Jean’s big party. Jukebox musicals by nature have highly contrived narratives – a lot of work has to go into making these pre-existing songs fit together in a logical way to tell a story – and this film is no exception. Early on you can sense there is a lot of setup being done, entire subplots are introduced in order for single lines in a song to make sense, and there are moments when things turn quite quickly. But unlike other films which have chosen to make fun of the contrived nature of their narratives by going over the top, Sunshine on Leith retains a down to earth honesty. These are still real characters telling a largely relatable story. To most people the Proclaimers are one-hit, or at most two-hit, wonders. They don’t have the long back catalogue of well-known hits that other bands given the jukebox musical treatment have. But while the lack of familiarity means you don’t get that little spark of recognition with each song, it does allow the songs to fit into the story less obtrusively. It also ends up being the lesser known tunes rather than the hits which provide the film’s best numbers: ‘Over and Done With’ and ‘Oh Jean’ are great highlights, and the title track ‘Sunshine on Leith’ is sung beautifully by Jane Horrocks. While all of the cast can hold a tune, none of them are amazingly polished singers. But this adds to the charm of the film. The ordinariness of their voices really fits with both the music of The Proclaimers (and I mean that as a compliment) and the overall tone of the film. This is not a glamorous, sparkling musical. It is a musical about ordinary people, performed by ordinary people. 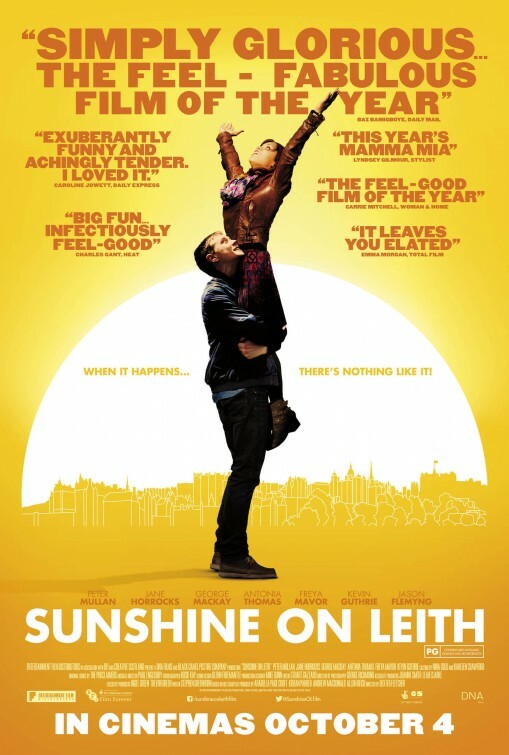 Sunshine on Leith is an unpretentious and exuberant film, a joyful smile of a movie. Have you seen Sunshine on Leith? Leave a comment and let us know what you thought.